Dr Singh joined Department of Surgery and Cancer in March 2015 as an expert in physiological signal analysis and Intelligent systems. He brings in wealth of experience in portable neuroimaging (Electroencephalography, functional Near-Infrared Spectroscopy). 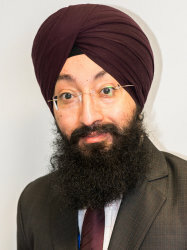 Prior to joining Imperial, Dr Singh has worked in high profile departments such as Neonatal Unit at Rosie Hospital Cambridge, Biomedical Optical Research Laboratory (BORL), University College London, Centre for Systems Neuroscience, University of Leicester, Impaired Consciousness group, University of Cambridge and Intelligent Systems Lab, University of Warwick. At Imperial College, He has been crucial to the investigations on the surgeon's brain. He has developed specialist methods to decipher stress-related responses in surgeons. Dr Singh’s research portfolio also includes Machine learning based Eye-tracking data analysis, Neurofeedback, Brain computer interfaces (BCI) and Artificial intelligence in Medicine. He is involved with the day to day supervision of Clinical Research Fellows (PhD) and BSc students at Brain Cognition Lab, Hamlyn Centre for Robotic Surgery, St Mary’s Hospital.